When I was pregnant with David, I went to get my usual sonogram to find out if this precious little one was a boy or a girl. The tech moved the wand around a bit and said, "Well, I'm not 100% sure but I think that it is a girl." I breathed a huge sigh of relief. I have three younger sisters. I was a babysitter/mother's helper extraordinaire. I could handle this. The tech then asked me to go walk around a bit and come back so she could get a better reading of the heartbeat. I came back and she moved the wand around again. After a moment of silence, she said, "Oh. That's not a girl." What in the world was I going to do with a boy? I knew nothing about those little loud, dirty things. Six and a half years later, I still sometimes find myself wondering what in the world I am supposed to do. How do I wrangle this small person with so much energy? That's where Wild Things comes in. If you are the parent of a strange person who tracks dirt into your house and makes your bathroom a danger zone, this book is for you. Stephen James and David Thomas have double know-how for this particular book. They are both fathers of boys and both men work as therapists with children and adults. Their book is broken up into several sections. The first part is entitled "The Way of the Boy" and it breaks down the different stages from toddler to adulthood, with an emphasis on the developments that your son is going through during that stage, what he needs from you, and tips to put those concepts into practice. After that, James and Thomas tackle the things that are unique and challenging about the minds and hearts of boys. They spend time on the ways that boys learn, their need for unstructured and physical play time, and the unique ways in which mothers and fathers can create bonds with their sons. I knew that this book would resonate with me as a parent from the beginning, when the authors write that the book's subtitle is not haphazard. They note that teaching is important but when we say that we can 'mold' or 'shape' our children, we are implying that our children will turn out perfectly if we achieve certain goals. "It [nurturing] first takes into account who a boy is created to be, and then looks secondarily at our role as influencers on that design...Boys need us first to recognize who they are. Then they need the help of wise and committed adults in navigating the way from boyhood to manhood." My favorite thing about this book is how precise it is. Instead of just giving vague ideas, there are tips at the end of each chapter that will help you integrate the things boys need at that particular stage. For example, in the section about a boy's brain, they teach that boys are not great at impulse control, multitasking, or talking about their feelings.Then they recommend lots of time for active play and breaks when needed. The authors also advise that you teach your son how to articulate their emotions and create opportunities at home that will use their vivid imagination and intellectual strengths. 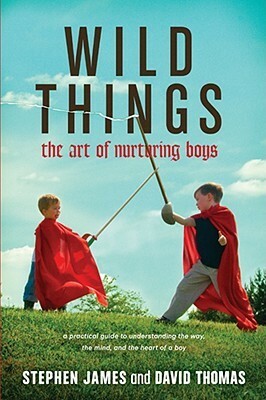 Wild Things: The Art of Nurturing Boys is a great resource for anyone who is raising or working with boys. It is clear on every page that both writers have a heart for boys and young men. The genuinely want them to succeed at every stage of life and they want you as their parent, grandparent, teacher, or coach to be a part of that success. This is a book I will be referring to often as my son grows up. Note: This book is written from a Christian perspective, but the authors don't beat you over the head with it. There is so much in this book that will be applicable for all parents, regardless of your beliefs. I think everyone can agree that we should teach our children that there are things in the world that are bigger than they are, right? Oh, how I remember the nerves I felt at the 20 weeks ultrasound! I don't believe boys and girls are very different from each other (or, at least that there's more variation within each gender than between the genders), but I still wanted to have girls. I'm one of three girls, and it's what I knew (meanwhile, my husband is one of only two boys). We're very happy with and grateful for the family we have, but I do wonder what it would've been like to have a son. Lots of people ask (assume?) that we're trying for a boy. But no, we're done. I'm with you there - girls seem totally manageable when you have sisters! I'm always surprised by how many people seem to think that it's perfectly acceptable to ask if you plan to have more children. What a personal question!! In the beginning I really wanted a girl, but now that I have a boy, a ramped-up four-year-old, I know that I got exactly what I needed. And I need this book because it sounds amazing! Parenting books make me nervous because some of them are just dreadful, but I got so much out of this one! I ordered this one last week and read it this weekend! I think I would've appreciated more case studies and examples from their practice, but overall, I found it really helpful. Especially the breakdown of normal (sometimes challenging) behaviors by age. Thanks for a great recommendation! I'm so glad liked it. I found the breakdown by age immensely helpful too. I'm planning to take some notes before I take it back to the library! I have never found most parenting books helpful, but this one actually sounds good. I am impressed with the fact that the authors offer specific suggestions. I wish I'd had this when my 15 y/o son was little. :-) I especially could have used some help in the impulse control area. Not that this problem has completely gone away in 15 y/o boys, mind you. I liked so much that this book covered a wide range of ages. I could nod in agreement about toddlers, get insight about my son in elementary school and study up on the years to come!